What is Permaculture? Permanent agriculture. A system for feeding and caring for ourselves that can be supported indefinitely by Nature because it imitates Nature’s own system of abundance. Permaculture was developed in Australia in the 1970s by Bill Mollison and David Holmgren and has spread in a grassroots movement around the globe. Permaculture takes the best of traditional practices that have a proven history of effectiveness and combines it with the best ideas and technology of modern science. Permaculture has been proven to work on various scales and in many climates and can easily be adopted to create sustainability on your homestead. Here are some basic principles with examples to get you started. Permaculture Principle 1: Make use of biological resources. Example: It’s gardening time and the raised beds are just waiting for some lovely soil to get things going. Many people would go to the local box store and buy many, many plastic bags worth of topsoil. The problem is, that topsoil was scraped away from another location, leaving that location’s soil bare. Then there are the issues of all the unrecyclable bags and the gas spent shipping the soil to the box store and to your home. And you’re not buying local. And that topsoil costs money! Instead, look for ways to build and amend the soil with nearby resources such as your compost bin, your neighbor’s horse stables, your other neighbor’s grass clippings, the wood chips from the tree the utility company just cut down… you get the idea. Permaculture Principle 2: Each element performs multiple functions. Too often in our society, we chose to specialize in one or two functions but a more sustainable choice is to strive for multiple functions. Try to include plants, animals, and people (yes, people) in your site that perform multiple functions. Aim for at least three functions. You may question multi-functioning in humans. However, consider that many people in our society have a specialized skill such as computer programming and his or her salary pays for a housekeeper, a gardener, entertainment, a carpenter, the groceries, and so forth. In order for a person to be multi-functioning, it is best to strive for a broad range of practical survival skills such as gardening, being better parents and spouses, building and fixing, housekeeping… and then we will function not only as a computer programmer who brings home money but as a caretaker, food producer, entertainer (once we learn to play the harmonica), and manager of maintenance. Example: Take a look at the wonder plant, comfrey. It is a perennial and it is hardy, so once you have planted it, it no longer requires much input or care. Comfrey can be used to heal wounds and bruises, even broken bones. It can be fed to livestock for various ailments and as a spring tonic. Served up in salads or stir-fries or teas, it provides protein, potassium, calcium, and vitamins A, B-12, and C. Comfrey attracts beneficial pollinators. Its long taproot pulls nutrients into its leaves. This, and its high potassium content, make comfrey valuable for mulch, fertilizer, and compost tea. And the little lavender flowers are lovely. Permaculture Principle 3: Each function is supported by many elements. This principle, I believe, is a natural for most homesteaders—always have a plan A, B, C, and a D for good measure. Create greater choice and sufficiency for your homestead by being sure you have multiple ways to complete each function. Example: We all hope that food will be readily available from our grocery stores and that we will be able to get to those said stores and pay for that said food. Okay, that’s plan A and a tenuous one at best. So your plan B is to raise chickens—they supply a steady source of protein in the form of eggs and meat. But what happens if that roving pack of coyotes has a feast one night? Plan C: your herd of rabbits. Likewise for plant sources. Now is the time to plant berry bushes, fruit and nut trees, vines and perennial edibles. Of course, most of you have a large garden of annual edibles. In addition, consider using container gardens to extend your garden space and to extend your growing season through the winter. As further back up, consider learning how to hunt game and forage for wild edibles. Permaculture Principle 4: Know your zones. The idea of zones helps to maximize efficiency. Things that must be dealt with often, harvested often, or are particular favorites should be placed within Zone 1, which surrounds the house. Generally, there are six zones, with those things that need the least care being placed in the sixth zone. Example: The usual example given is the lemon tree by the kitchen door. For many of us, our culinary and tea herbs would be wisely placed just outside the door where we can snip a bit of oregano off for the pasta sauce or cut a bit of mint for our morning tea. Further out, in zones 2 and 3 you might choose to place the compost bin because you may only need to deposit scraps every other day. 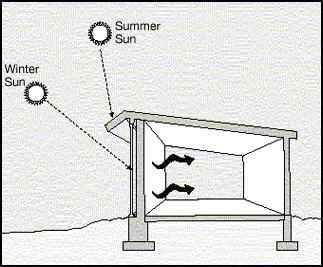 The chicken coop might be found in these zones as well so that it’s easy to collect eggs once a day but the sights and smells are removed from the house. Zone 6 would be a good place for your startup Christmas tree farm or your managed woodlot. Permaculture Principle 5: Relative location. In Nature, everything is in relation to one another and they benefit and support each other—Permaculture seeks to imitate this “interbeing”. One way the system does this is through the conscientious design of plant guilds. 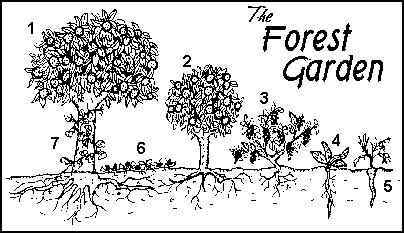 A guild can have up to seven “layers”: a large tree, a small tree, shrubs, the herbaceous level, root vegetables, soil level, and the vertical layer. In a well-designed guild, each layer contributes to the overall health of the guild. The taller layers provide shade for the lower levels while the lower levels make use of space and nutrients that would normally be wasted. Some plants might help to fix nitrogen while others attract pollinators and/or beneficial predatory insects. Some plants may provide habitat for birds which in turn will eat damaging insects while others collect rainwater by covering bare ground and provide mulch when they decompose in the autumn. Of course, all of the plants should be chosen for the multiple functions they can perform. Example: If you have the space, consider planting a large fruit or nut tree. This will provide shade for the other layers, support for the vertical layer, habitat for birds, and, of course, food for you! Next comes the small tree, perhaps a dwarf fruit tree, and then the shrub layer—perhaps a blueberry or currant bush. The blossoms of the fruit tree and bush(es) will attract pollinators while also feeding your family. The herbaceous layer would be any medicinal herbs, culinary herbs, and/or perennial edibles (hopefully your plant choices can serve all three functions). Some examples are comfrey, chickory, or dandelion. Next is the rhizosphere—plants such as the root vegetables; consider planting some perennials such as American groundnut. At the soil level are low growing plants like strawberries and finally, the vertical layer makes use of the trunks of the trees. Examples here would be hardy kiwi and the maypop. 6. Soil Surface: Ground cover i.e. strawberries, etc. Be aware of the slope of your land and look for ways to make the best use of this elevation. Observe how the slope can create variations in shade, water retention, and soil. Make good use of the land you are working with. Example: Oftentimes, land at the top of the slope has drier, sandier soil. Instead of fighting gravity, building lots of terracing and amending the soil excessively, consider using this space for plants that thrive in this type of environment. Many Mediterranean plants would be quite at home with the dry soil and the intense heat. Likewise, if the land at the bottom of the slope is shadier and moister, take advantage by planting elderberries, Solomon’s Seal, or Lady’s Mantle. Permaculture Principle 7: Energy recycling. One problem with our current systems sustainability is that it is a linear system. Resources are harvested, a product is produced, consumed, and then shipped to the landfill. Permaculture aims to create a closed loop of energy. Look at all of the waste in your house and see if it can become a resource instead. The ideal is to be able to create a loop that doesn’t even require an input because the resource can be found on your own site. Example: Consider the chicken egg. Your hen produces an egg, which you consume. You then use the egg shell as fertilizer and slug repellent for your zucchini plant. Your plant produces an abundance of zucchini and some of the scraps feed the hen, who then uses that energy to produce yet another egg. And the cycle continues. Permaculture Principle 8: Natural succession. When Nature is faced with bare and/or poor soil, it uses succession to improve the soil and to allow for more and more biological diversity. First the pioneer plants move in to cover the soil, stop erosion, and provide biomass and mulch as they decompose. Eventually, the seedlings of shrubs will grow, protected by the pioneers. In the shade of the shrubs, the tree seedlings will begin to grow and over time the land is reclaimed for productivity. Imitate this use of succession; plan for it from the beginning. Example: If you are faced with bare lawn or you wish to convert some of your land to a more permaculture-like garden, plant some quick-growing plants such as clover, hairy vetch, or a wildflower seed mix. These plants will create shade, capture water, prevent erosion, attract pollinators, and improve the soil. Once these plants are established, begin to move slower growing, more permanent plants such as the herbs. These in turn will provide shade and shelter when you plant shrubs and eventually tree saplings. Permaculture Principle 9: Make full use of the edge. In Nature, the greatest productivity and diversity is found at the edge of ecosystems. Think of the shoreline where aquatic plants and animals live so closely to the land creatures. Or consider the foothills where lowland plants and alpine plants meet for greater diversity. Seek to create these edges in your own gardens and land. Example: Permaculture gardens often look very different from traditional gardens because they make use of organic shapes such as “kidney bean” gardens and spiral gardens. 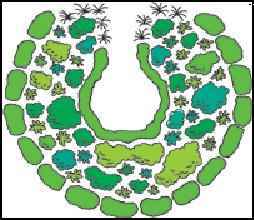 A popular permaculture shape is the keyhole in which the garden is shaped like a circle with a keyhole shape that “juts” into the circle. In this way, plants that grow taller can be placed at the back of the circle, providing some shade and protection for the plants in front. The keyhole creates a sun-pocket by gathering and holding heat and so heat-loving plants can be placed around the edges of the keyhole. Permaculture Principle 10: Understanding sectors. Every piece of property has various sectors or “wild energies” that can be destructive or beneficial. These include wild animal trails, fire threats, running water, strong winds, even an ugly view. Design your landscape to mitigate or benefit from these sectors. Example: We were lucky to be able to build our house and we purposely faced the side with large glass windows towards the sun for passive solar energy. The north side of our house has fewer and smaller windows and is sheltered from cold winds by a hedge of laurel. A large part of the problem in commercial agriculture is that farms now focus on monocultures—only growing one type of hybrid corn or raising only Angus beef. However, monocultures are unsustainable because one damaging pest can wipe out an entire crop which in turn requires greater and greater inputs of pesticides and the soil becomes depleted, requiring greater and greater inputs of petroleum-based fertilizers. Largely missing is the small, diversified farm that produces many types of vegetables and fruits, raises different livestock, and is surrounded by beautiful fruit and nut trees that also provide lumber and firewood. Look to creating this diversity on your own homestead. Example: The homestead is the perfect place for diversity. Grow different types of heirloom vegetables so that if one type of plant is taken by the blight, another type will probably survive. Add perennial plants such as fruits and nuts to supplement your annual garden. Raise a variety of animals. Celebrate diversity in your life! Different literature and websites will provide different lists of principles. This one is based on Sonya Wallace’s Permaculture Pathways blog. Other good permaculture resources include Fantastic Farms’ website, the magazine, Permaculture Activist, and the book, Introduction to Permaculture, by Bill Mollison. Much time is spent observing and designing in order to adopt these principles. Remember that it doesn’t have to be done all at once—baby steps count. But once you begin utilizing these principles, you’re that much closer to a truly self-sustaining homesteading life.